Barefoot In Blue Jeans: Isabelle's 4th Birthday NEMO Cupcakes! 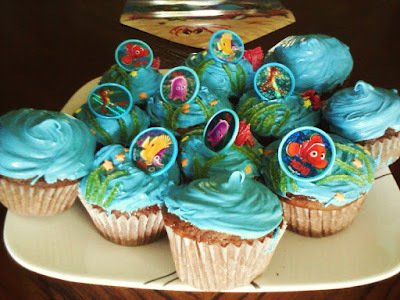 Isabelle's 4th Birthday NEMO Cupcakes! Friday was my cousin's 4th birthday, and yesterday was her birthday party. 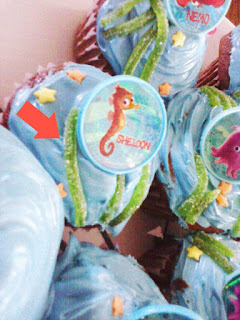 She had a Nemo from pixar Party! It was very cute. When we got there, the kitchen was busy! My aunt came up to my mom and I and said, "I need you!" She told us that the cake had spilled and it was ruined, and that they made another cake, and this this one was cooling. 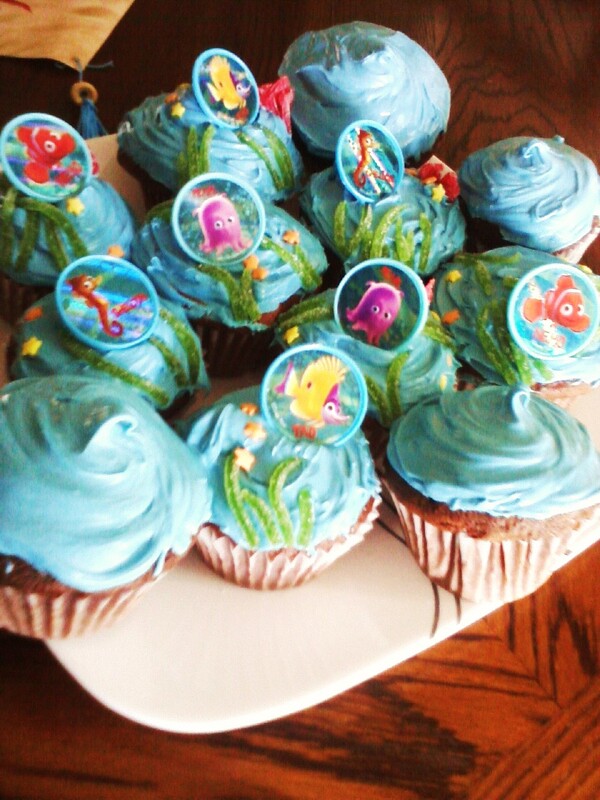 My aunt then said to me, "Ok, cupcake master, I need you to decorate the cupcakes." I was very excited. So I put everything I needed on the table, mixed a pretty blue color, and began decorating! My Aunt Shawna bought lots of sour string and candy for decorating, so I used the green sour string as sea weed. 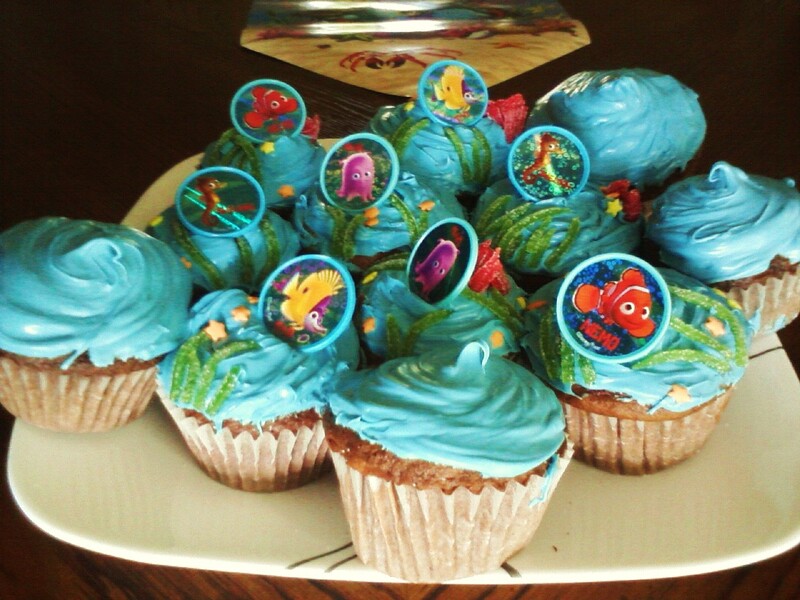 Aunt Shawna got Nemo rings for the toppers. I thought they were so cute. I used the star sprinkles as star fish and obviously the blue frosting is the sea. I didn't have my camera with me, so I used my phone. I will post the picture that my aunt Shawna puts on her facebook. It's better in resolution. 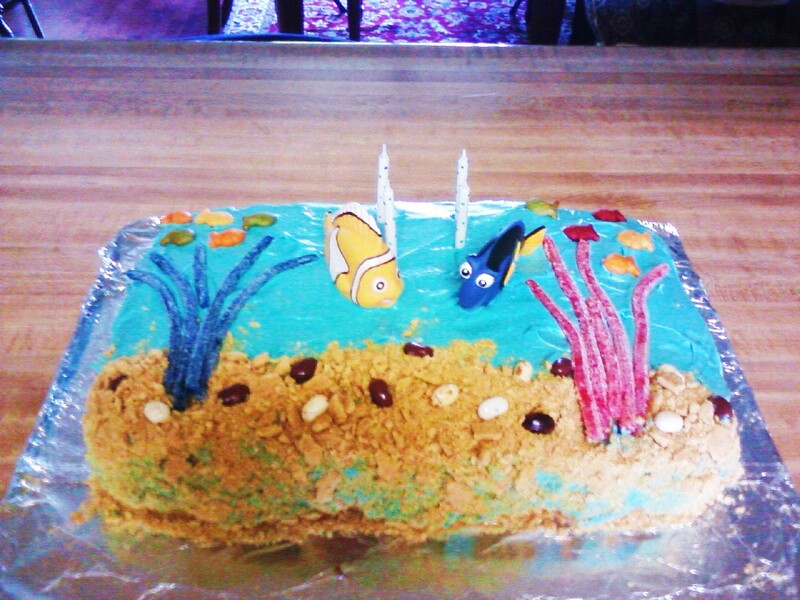 Aunt Shawna made the cake, and my grandma helped decorate it. I had nothing to do with the cake, but it's just so cute! 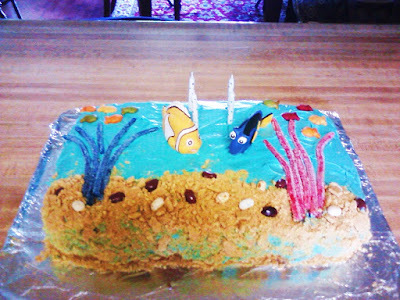 Blue frosting for the sea, sour string for the sea weed, jelly beans as the rocks, and graham cracker cumblies for sand, rainbow gold fish as schools of fish and a plastic Dory and Marlin. It was a very cute party!